Our Corfu resort guide is designed to help holiday makers as well as travellers decide which of the gorgeous towns and villages to visit on the Ionian island of Corfu. If you’re one of those people who simply goes to the travel agent and books the first place that they suggest then you probably don’t need this page, if however you like to spend a bit of time making sure that the place your booking has all the amenities, near by historical sites or attractions and the perfect blend of night life and quiet relaxation then you’ve come to the right place. The most popular tourist resorts are Sidari, Kassiopi, Kavos, Ipsos and the capital Kerkyra. Each will have a large selection of hotels, tavernas, restaurants and evening entertainment, Kavos is the favourite with the 18-30 party people with Ipsos and Sidari lively too. Kassiopi and Kerkyra are a bit more cultured but still packed with people and amenities. For those that prefer a more traditional Greek island get away, why not try Agios Georgios on the north west coast or Kalami on the north east, both are set around gorgeous bays with fantastic views, both are touched by tourism but not spoiled by it so you can get a drink and a meal in the evenings, there’s a choice of accommodation but it’s not heaving with people like the places above are. 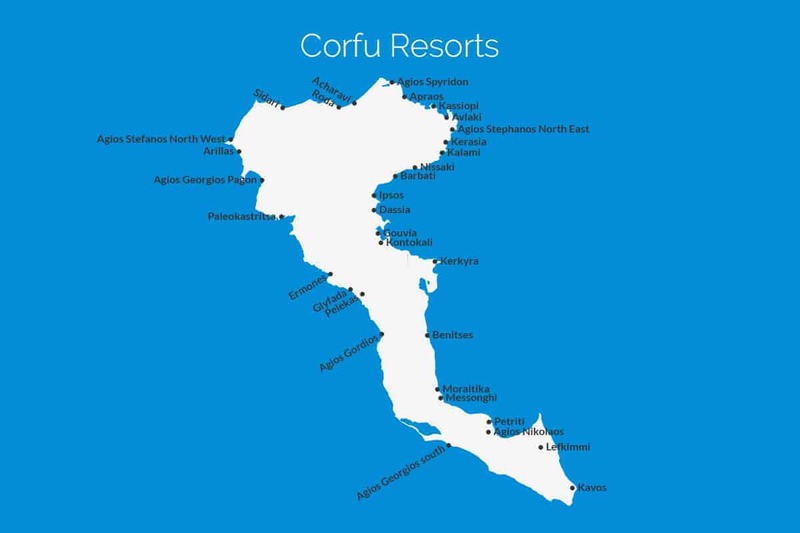 Listed below are the 33 main resorts on Corfu, all you have to do is click the ones you are interested in and that’ll take you to a page that gives you a more in depth look at that particular resort with descriptions, map, quick look icons and much more. Acharavi is a popular resort on the north coast of Corfu that’s frequently visited by both families and couples as it offers a nice, incredibly long beach that’s mainly pebbles but also has some sandy areas too. Acharavi isn’t a party resort but it does have a good selection of nightlife, there’s no shortage of restaurants either. The northern Agios Georgios is a small and relatively new resort that’s based around the large sand and pebble cove. This resort is known as Agios Georgios Pagon but is also often referred to as simply Agios Georgios north. If you’re looking for a quiet and relaxed package holiday based around a nice beach then this could be the place for you. Agios Georgios has a good selection of hotels, restaurants, bars and shops. You’ll find a lot of the facilities around the beach and this means you get to enjoy the sea views with your meal or drinks. The main downside of Agios Georgios is the fact that it’s a long way from the islands other major towns and villages so not a good base to explore from. The small village resort of Agios Gordios is in a great location on the west coast of Corfu and is surrounded by Olive groves, mountains and the fantastic golden sand beach. There are plenty of hotels and apartments available with costs to suit all budgets. There’s also a wealth of tourist facilities like bars, restaurants, tavernas and supermarkets. Agios Nikolaos is a small village in the south east of Corfu, it’s set on a hill but the land around it is fairly flat, most of the residents work in agriculture as there’s virtually no tourism in the village. Like most of the southern end of the island it’s very quiet, with minimal tourist facilities and no hotels whatsoever. Agios Spyridon, also known as Saint Spiridon, is a beach resort based around two fantastic bays with gorgeous views over to the hills of Albania. It’s located in the north east corner of Corfu island. There are a handful of restaurants and tavernas to try out and a few places to keep the little ones entertained including a small crazy golf course. Agios Stefanos is a small picturesque harbour village with views out over the Ionian sea to Albania. it’s an up market resort with a selection of plush villas available to rent in the hills behind the harbour. At the harbour you’ll find a number of tavernas and a couple of bars so you can take in the views whilst enjoying a traditional Greek meal. Agios Stefanos in the north west is based around a picturesque 1km long sandy cove. There are several tavernas, some on the beach and some back in the main village. There’s a good number of hotels, bars and supermarkets too so you really do have everything you need for the perfect Greek island holiday. The village of Apraos is small and quiet with virtually no facilities, you wont find late night bars, souvenir shops or supermarkets, there are a couple of tavernas down by the beach and a handful of hotels. If you need anything else you’ll have to travel to the nearby village of Kassiopi where there are plenty of places to stock up on supplies. Arillas is a fairly small resort located up in the north west of Corfu island, it’s a fairly quiet and peaceful resort that’s perfect for families as children can play on the golden sand beach and paddle in the crystal clear waters, teenagers will enjoy the water sports on the beach and adults can relax or visit one of the local tavernas. Avlaki is a relatively unknown village that lies just south of Kassiopi on the north east coast of Corfu. Avlaki is more of a collection of hotels and villas rather than a resort, the main attraction to Avlaki is the long and beautiful bay that it’s based around, it’s a picturesque place with mainly shingle underfoot and clean, crystal clear water. The resort of Barbati sits either side of the main coastal road on the east of Corfu and leads to a long shingle and pebble beach about 10 minutes walk down hill. The village has all the things a tourist needs including supermarkets, souvenir shops to get your fridge magnets and other mementos as well as a wealth of good restaurants. Benitses is a small village on the east coast of Corfu roughly 9 kilometres south of the airport and the capital making it a short 20 minute drive or taxi ride. Benitses is also often referred to as Mpenitses. There is a pebble and shingle beach with a marina at the northern end that is home to close to 200 boats and yachts. Dassia or sometimes Dasia is a resort, set on both sides of the main coastal road on the east coast of Corfu, it has a good selection of restaurants to suit all tastes as well as all the usual tourist facilities like car rental shops, souvenir shops, supermarkets, dozens of hotels and tavernas to choose from as well as a camp site. Ermones is a small resort in the centre of the west coast of Corfu about 20 minutes outside Kerkyra. There’s not a huge selection of hotels but there are a few large hotels around the beach, some that even offer apartments with private pools Ermones is perfect for people who want a slower, quieter pace to their holiday. Glyfada is in the middle of Corfu on the west coast and is a very small and relatively quiet resort, there are no late night bars or clubs or any other lively evening entertainment. There are a bunch of restaurants, mainly based around the beach and a few hotels and apartments, again largely around the beach front. Gouvia is located on the east coast, just north of Corfu town and is a former fishing village that’s been developed over the years. At one time it was just a single road with bars, restaurants and shops rather than a complete village but as more and more establishments open it is becoming a genuine tourist resort with all the expected facilities. At one time, Ipsos was a party resort full of 18-30 type pubs and clubs but it has tried to shed that image over the years. At present that reputation has been left behind a bit, although it is still pretty lively in the evening and there remains a number of “English” style bars so it’s probably not suitable for those looking for traditional Greek charm. Kalami bay is set beneath the hills on Corfu’s north east coast. Kalami definitely isn’t a lively resort but it does have a small selection of tavernas, shops and bars as well as a lovely traditional Greek feel to the village. Kalami will appeal mainly to people who want a slow paced holiday, to relax and enjoy the sun, sea and gorgeous scenery. Kassiopi is the largest village in the north east of Corfu, it’s an attractive village based around the harbour. This is where you’ll find a number of restaurants with great views where you can sit and watch the world go by whilst enjoying your meal. There is also ample accommodation available, shopping opportunities and late-night bars. Kavos is located right at the bottom of Corfu island and is the main 18-30 resort on the island so it’s full of young revellers sleeping in the day and partying all night. Not only does Kavos have the wildest party nights on the island it is also home to a cracking beach, it’s a large sandy beach with all sorts of entertainment and water sports. Kerasia is a quiet cove on the east coast of northern Corfu between Kalami and Agios Stefanos. Kerasia isn’t really a village as there’s just a beach with a single taverna and a few villas available to rent. There’s no shops, no bars and no facilities like vehicle rental or travel agents so it’s perfect for those looking to get away from the crowds. Kerkyra or Corfu town is roughly in the centre of the east coast and just a couple of kilometers from the airport, it’s the capital of the island and the largest town. Kerkyra caters to those that want to experience a bit of history as well as a wealth or amenities right on the door step. The beautiful old town is well worth taking a trip to if you can. Kontokali is a small coastal village. Nightlife is minimal but there are a couple of bars. There’s no shortage of tavernas and restaurants to choose from though and they have a wide range of cuisines to suit all tastes. Kontokali is a great location if you want to travel round Corfu and take in a lot of the villages, beaches or attractions. Lefkimmi is the second largest village on Corfu behind Kerkyra it’s located towards the south of the island on the east coast. Lefkimmi is a traditional port town built amongst the olive groves and vineyards of the area. The harbour offers daily ferries to Igoumenitsa on the mainland as well as trips to the islands of Paxos and Antipaxos. Messonghi, sometimes known as Mesoggi is a small Corfu resort that merges into Moraitiki on the east coast. Although Messonghi is small it does have all the amenities, there’s a good selection of restaurants and bars, a couple of supermarkets and some shops too, most of which are located around the beach area or along the main road. Moraitika is on the east coast roughly 20km south of Corfu town and is a very popular resort for families and young couples. it’s based around a single road and a large beach. Moraitika offers a wealth of tavernas, pubs and bars to keep you entertained day and night. If you’re looking for a lively but not crazy holiday then this is a good choice. Nissaki is a traditional Greek village that’s ideal for those wanting a relaxing holiday away from the crowds, it’s spread over a large area with many villas and apartments dotted about that are available to rent. Nissaki is up in the popular north east region of Corfu island, with Barbati just to the south and Kalami in the north. Paleokastritsa is found up in the north west of Corfu, it’s ideal for families and couples but probably not lively enough for teens or those looking to party. The main section of the resort is down by the harbour where there’s a number of tavernas. The rest of the village is spread out so it’s great if you like a bit of a walk. Pelekas is on the west coast of Corfu, roughly opposite Kerkyra and around a 20 minute drive away from both the capital and the airport. It’s a large village with tightly packed buildings that include several tavernas, restaurants and rooms to rent which is why it has become a hot spot for backpackers. Also nearby is Kaisers Throne. Petriti is a small fishing village on the east coast, it’s about 20 minutes from Lefkimmi and nearly an hour from the capital. Petriti has a pretty little marina that’s home to a couple of tavernas where you can sit and watch the colourful boats come and go as well as enjoying the scenery with a cold glass of Mythos or a carafe of local wine. Roda is an old fishing village that’s grown into a family beach resort over the years. It’s located on the north coast of Corfu close to Acharavi. As Roda is now a well established tourist resort, there are plenty of good restaurants and tavernas as well as a nice selection of bars but it’s remained a laid back, friendly village. Sidari is a very popular Corfu resort on the north coast. Sidari predominantly caters to package holiday makers with lots of hotels, loads of evening entertainment, with some places having live music, Greek dancing, plate smashing or Karaoke. There’s also plenty of cocktail bars and even some clubs that are open late into the night. We want Which Greek Island to be as accurate and informative as possible, so, if you notice anything wrong with the Corfu resort guide or any other page please let us know. We’re also on the lookout for great photos to show people what the places we’re describing are like. If you have photos from any of the resorts in Corfu or from any of other island on the site then we’d love to see them, simply click the button below to go to the photo upload page. Thanks.